A subtle mix of pinks and mauves. This bouquet can be ordered in REGULAR (a super fresh mix of flowers), SPECIAL (a larger bouquet with a more or those gorgeous roses!) 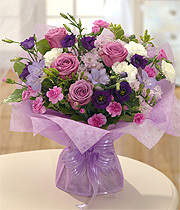 or LUXURY ( for a special occasion or that special someone, push the boat out with a luxury bouquet).